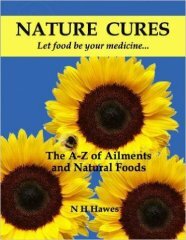 A fascinating 1130-page compendium of foods and their health-giving-properties together with illnesses and the natural foods that are known to relieve them. Also included are hazards and the foods that counteract them and essential nutrients and minerals and the foods that can provide them. Nat Hawes began researching the relationship between food and health more than 15 years ago prompted by family health problems. She initially shared her knowledge on her website naturecures.co.uk, which she updates daily and has now received nearly two million hits. She has also qualified as a nutritional therapist. at last i have found a book that gives useful information in an understandable format-woopee! Interesting book which is easy to navigate through.